Is LottoShop a Scam or Legit? Read Reviews! 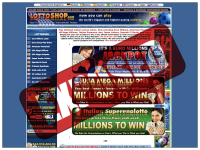 LottoShop Exposed — Is It Worth to Shop Lottery Tickets Here? Get a load of LottoShop.com. I opened this site up to check it out and didn’t know where to start. At first glance, the biggest challenge is figuring out what to click on first. This is an online lottery provider though I’m starting to think they might offer something else. I just can’t figure out where to start. It is so noisy. All I wanted to do is find the terms and conditions to see how they operate. I just have to figure out where they might have put it. This site is so noisy – why? Ultimately, I’m here to figure out if I want to play lotteries so I started there. It looks like there are twelve different international lotteries offered at LottoShop.com ranging from the usual US and European mega jackpots through to Japan’s Jumbo Draw and some of the Aussie lotteries. There are no single ticket purchases, but most have a bonus benefit of some extra free draws included in subscriptions. There are no syndicates. According to LottoShop.com, they don’t take any commission or fees for processing your winning and getting it to you. Any fees are built into the price you pay for your tickets. There is no information how quickly you get your winnings or how you withdraw it. Make sure you read the small print at LottoShop.com as there are different rules and regulations on who can actually play that game. Generally across most lotteries, Pakistan seems to be no go, but Philippines, Australia, the USA and the Netherlands all show up on different games they can’t play here. There is no real info on any other restrictions. Though they have a place to click for scratch and win cards, forget it – it doesn’t work. It comes up with an error. LottoShop.com also offers their games in six other languages – well sorta. Click on any of the languages available and it pops you into Google Translate. There is also link on the left hand side that will pop you into Google Translate for any language. There is a “how it works” but that’s it. And even that is pretty limited. Then again, there is so much noise on this site, there could be a terms and conditions buried somewhere. I thought I’d ask them but there doesn’t seem to be any way to do that. This online lottery provider is one of the stable of Overseas Subscribers Agents (OSA) out of the Netherlands. They operate Winalot.com, EuromillionsJackpot.com, InterLotto.com, ClientAdvisoryService.com and InterLottoNews.com. OSA has a snail mail and email address, phone number and supposed 24/7 help desk. The only problem is none of it seems to work. It didn’t seem to matter what I clicked on, it all came up with error messages. Even their pop up message saying they were off line and send a message, wouldn’t work. Would you mind rating LottoShop.com? The simple fact that none of their online options for communicating with them actually works (that’s asking questions) was enough for me to say forget it. The other thing was the only way to play here is to play multiple games. I want an option to simply try them out before I start signing up to play longer term. Add there is no information on how to cancel. Add no idea how to tell them if I want to cancel. When will I get my winnings. This site gets a thumb’s down. If you can figure out where some of the more important information is available on their site, please tell me. Better if you can figure out how to communicate with them, please also tell me.